Our reading group picks have been chosen for their rich content and suitability for group dialogue. The book description and author biography are available to assist you in deciding whether our pick is suitable for your group. If it’s a fit, discussion questions and Q&A with the author will help get you started. If you would like to be in touch with the author to schedule an event or to participate via phone with your reading group, let us know. We welcome your comments and feedback! Sometimes what we already “know” about Jesus gets in the way of our really knowing him. Many depictions of Jesus show him as a character who coolly and calmly floats above the grit and grime of human existence. He doesn’t hurt, he doesn’t fear, he doesn’t laugh and, most tragically, he doesn’t love very passionately. He seems not to feel at all. But a closer look at the Bible reveals something surprisingly different. In this eye-opening spiritual study, Peter Wallace examines Jesus’s actions as well as his teachings to uncover a passionate figure who was involved, present, connected, honest and direct with others. Through Wallace’s deeply personal insights and compelling examples, you will be encouraged to model this passionate Jesus by building personal authenticity in every area of your own life, particularly in your self-acceptance and self-expression, your relationships with others and, above all, your relationship with God. What moved you to write this book about the human emotions of Jesus? This book grew out of a simple reality: I love Jesus. I am intrigued by how he lived and what he taught. I work at shaping my life around those things. Over the years of my life in one way or another I have studied and written about him. Several years ago I wrote a devotional on the Gospel of John, and another on the Psalms—which are filled with raw emotion—and in the process some of the seeds for this book were planted in my soul. But during an emotionally difficult period of time for me, when I was wrestling with a number of rough personal issues—and I was overwhelmed with anger, fear, and grief—I yearned for the presence of God in a real way to help me get through. I took a retreat on St. Simons Island, Georgia, as I had for many years, and spent time re-reading the gospels with fresh eyes and an open heart. And as I absorbed what I read in the midst of this wad of feelings, I started noticing the emotions of Jesus clearly evident on every page. He revealed himself as a living and breathing human being who wept tears of bitter grief, raged in anger, celebrated life joyfully, trembled in fear, and loved passionately. He became so real I could almost see him, hear him, smell him. And by writing this book I wanted to try to open the way for others to experience this spiritual phenomenon. Who do you think would enjoy this book? Anyone who is wrestling with becoming a fully human, fulfilled, spiritual person. It may sound selfish, but I essentially wrote the book for my own enjoyment and learning—because I wanted to capture what I was discovering about Jesus as I worked through the gospels. I realize that I am just like everybody else, dealing with trauma and turmoil as well as love and joy in life. So I hope anyone who wants to know God—as well as themselves and others—more deeply and more authentically will find this book meaningful for their journey. How did your discoveries about Jesus affect you? We will never know what Jesus was really like—and that’s no doubt a good thing because it leaves our minds open to spiritual imagination. But I think there is so much we can glean from the gospels about the way Jesus lived, how he presented himself so straightforwardly and authentically to everyone with whom he came into contact. He was open and honest about what he believed, what he was all about. He was lavish in sharing his love. I came to appreciate his utter authenticity as a way to get more closely in touch with myself, with others, and especially with God. I had spent a good portion of my life playing games, denying and repressing a big piece of the puzzle that is my life, in an attempt to keep things calm and not make waves. I discovered that’s not how Jesus lived, and that’s not the kind of life he calls us to. Every word he spoke, every action he took, was saturated in love and focused on the pursuit of God’s justice. And he calls us to follow him in this way. So if someone feels they are missing something in life, that they’re not connected with the reality of who they are in whatever way, I think this approach to knowing Jesus might help them, as it did me, become more self-accepting and thus more empowered to live honestly and serve others without judgment or hesitation. The subject of your book—Jesus’s emotional life and what we can learn from it—is not a common approach to studying him. Why do you think we don’t naturally consider Jesus as a passionate person? 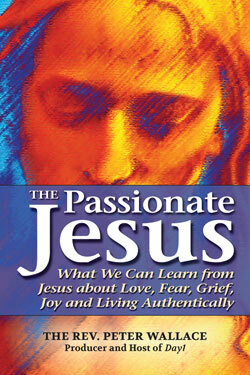 In researching this book, I was surprised at how few resources there were on the emotions of Jesus. I found a few recent scholarly works, one sublime devotional book of a century ago, and a number of articles. But I expected this to be a rich field of study. Why isn’t it? I think part of it is fear. We want to keep Jesus under control. We don’t want our faith to ask too much of us, to shake up our life, to force us to make difficult choices. “Gentle Jesus, meek and mild,” the hymn says, and surely there were times when he was so. But far more often he was freely emotional and utterly passionate in his teaching, his interactions with his disciples and the religious elite, even the needy and suffering. I think I grew up with the image of a dispassionate Jesus as a result of some of those motion pictures about Jesus from the 1960s, as well as colorful Sunday school illustrations and even stained-glass windows�in which he seemed so cool, calm, and collected, freshly shampooed and blue-eyed, barely raising his voice, leaving no wake behind him. But a careful reading of the gospels reveals a Jesus who is much deeper and more human than those two-dimensional images. When we see and understand his emotional authenticity, we can follow his example and live a much deeper, richer, more meaningful life, a life driven in the pursuit of God�s love and justice. How have readers responded to your book so far? I’ve have been deeply gratified by the enthusiastic comments I’ve gotten so far. I was surprised that so many people I admire, and who are very well read, told me they thought I’d offered something they didn’t think was even possible: a fresh perspective on Jesus. I’m grateful to the many book groups and Sunday school classes who have indicated that they plan on using it as a resource. One person told me they didn’t realize I was such a scholar! I still don�t believe that one; I intended this as an accessible book anyone could read and benefit from. What was your biggest challenge in writing the book? My problem with this study of the emotional authenticity of Jesus was that I realized I needed to respond personally to his example. I needed to be honest with myself and with others. And that wasn’t easy. While I had come out over nine years ago to friends and family, I hadn’t shared that aspect of my life much beyond those close circles. But I came to understand that this was part of me, I needn’t keep it hidden, and that being a person of integrity and authenticity required transparency. I hope that in sharing this part of my life I can be of help to others struggling with their sexual orientation or gender identification or whatever other internal struggles they face. I’ll never forget the time over nine years ago now when I sat on my parents’ living room couch and told them that I was gay. My dear father, now passed away, immediately responded, “Well, you’re still our son and we love you.” After a pause, he added, “You should write about it—I think you’ll be able to help a lot of people.” I am still moved by those words of acceptance and encouragement, and I hope he is right. But it’s not easy, and I still have many conversations and issues to work through in my ongoing journey toward authenticity. Even so, I feel closer to Jesus than ever. How would you describe yourself as an emotional being? What bothers you about the way you describe yourself? What encourages you? What would you say are your passions in life? What passions do you hope to develop? What is hindering you from pursuing those passions? When you think of Jesus, what image comes to your mind? How accurate do you think your image is? What misconceptions about Jesus do you think you�re holding on to? Why do you think it is helpful to see Jesus as an emotional human being? Have you ever felt unloved? What was the cause? Do you recall how lonesome, perhaps desperate, you felt? Can you identify individuals in your community, your workplace, your religious community who are unloved? What would it mean for you to love those individuals as Jesus loves us? Can you recall a time when you failed in love? Has a lover ever failed you? How did you learn to love again? Have you ever fallen out of love with God? What was the cause? Have you found your way back to God�s full embrace? How did that happen, or how do you think it might happen? When was the last time you embraced lovingly an enemy or an unlovely and unloving person? What would enable you to embrace that person? When was the last time you were so angry with a friend, a family member, or a partner that you mistreated that person out of your rage toward him or her? Recall the steps you took to allay your anger and heal that rift. Can you recall a time when you acted out of righteous anger in an attempt to overcome an unjust situation? A suggested practice is to repeat “Forgive us our trespasses, as we forgive those who trespass against us” ten times every morning as preparation for a day when you know you will have to ask others’ forgiveness because you have personally attacked them with your words or actions. How do you think that might help? Picture a time when you worried about things over which you had no control—such as the sudden loss of a job, the disruption of the natural world, the collapse of the economy, the end of the world. Think about the steps you took to overcome that anxiety. How effective were these steps? Many times we awake in the middle of the night with irrational, though sometimes quite real, fears. Can you think of ways that God helps us overcomes those fears? What are the three most frightening situations in your life today? How many of them are truly important to you? How can you separate authentic fears from those that paralyze and limit us even though they are simply the minor worries of our days? Remember a time when your life was shattered by the death of a loved one. How did you respond? Was your grief redemptive? Did you discover a way to embrace your grief in order to learn to trust in a loving God? We spend much of our waking life grieving the loss of one aspect or another of our lives: our health, our relationships, our communities when we move from one place to another, our loved ones through separation or death, and sometimes our religion. What are some ways that you can productively live with these moments of loss so that they define your life in a positive rather than a negative way? Recall a time when you sat with a grieving friend. Were you able to help that individual embrace the sorrow of the moment, and help him or her embrace the deep and lasting love of God? What might you have done differently? Do you make time for joy in your life? Do you make it a part of your daily schedule? If not, how can you make it more of a priority in your life? Do you think God laughs at our mistakes and our shortcomings? Can you laugh at yourself and allow yourself to approach God with a childlike joy of heart? When was the last time you laughed uncontrollably until you cried, danced with abandon in the brilliant sunshine, sang with gusto in the middle of a crowded city street? When was the last time you embraced the deep joy life brings? Why has it been so long, and what is stopping you now? Buddhism teaches us that smrti is the energy of mindfulness that helps us touch life deeply. What practices enable you to increase in smrti? How honestly do you think you have lived your life with those in your closest circles? Was there a time in your life when you lived in deceit? How did that feel? How will you seek to live a more authentic life in the days ahead? Jesus is the utterly human being, and he invites us all to live as fully realized persons as well. Do you think that is truly possible? How will you live in light of this aspiration? Now what?